Ancient samples from the Wang et al. 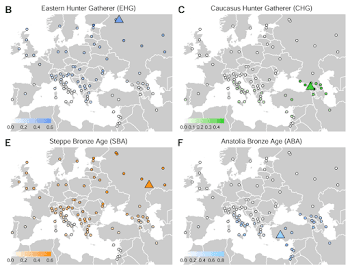 preprint on the genetic prehistory of the Greater Caucasus are now available as BAM files at the European Nucleotide Archive (see here). I've requested the genotype data from the authors and I'm eagerly awaiting their response. But various online genetic genealogy communities are already studying in detail the Y-chromosome data from the BAM files. One interesting outcome is that both of the Eneolithic steppe males, PG2001 and PG2004, apparently belong to Y-haplogroup R-V1636 (see here). This extremely rare subclade of R1b has apparently also been found in an ancient individual from what is now Armenia associated with the Kura-Araxes culture: Armenia_EBA I1635. Importantly, the Eneolithic steppe males are dated to 4336-4047 calBCE, and don't show any recent genome-wide ancestry from south of the Caucasus, while the Kura-Araxes individual is dated to just 2619-2465 calBCE. It'll be interesting to see whether Armenia_EBA I163 shows any genome-wide admixture from north of the Caucasus when I can test this with these new Wang et al. Eneolithic samples from the southernmost steppes. But in any case, if the R-V1636 link between the Eneolithic steppe and Kura-Araxes is real, then this is more evidence of migrations from the steppe across the Greater Caucasus into the Near East during the Eneolithic and/or Bronze Age. Such population movements could potentially explain the appearance of Hittite and other closely related Indo-European languages in Anatolia during the Bronze Age. - in fact, practically every analysis that I've run with Hajji_Firuz_ChL I2327 suggests that he harbors Yamnaya or Yamnaya-related genome-wide ancestry, which makes sense considering his Yamnaya-specific Y-haplogroup, don't you think? Heck, even if Hajji_Firuz_ChL I2327 is more or less accurately dated, and really was alive during the Chalcolithic period, then considering the points I've made above, the only honest explanation for his presence that early in what is now Iran is that there was a migration of an Yamnaya-like people from the steppes to the South Caspian region during the Chalcolithic. Of course, no matter how strong my arguments are, many people will choose to disagree with me nevertheless and believe what they want to believe, because this is such an emotional issue for them. I don't want to get into the details about that here, but suffice to say that it's imperative for many people, particularly those of Near Eastern and Southern European backgrounds, that the origin of Yamnaya is somehow, by hook or by crook, put south of the Caucasus. I'm not kidding. 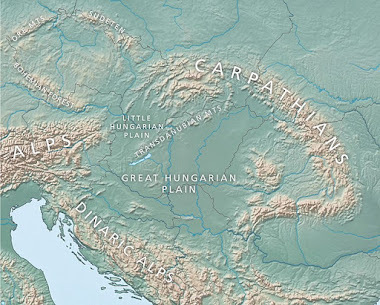 It's a pointless cause though, especially now considering all of the new ancient DNA data from Eastern Europe that make this scenario about as likely as Out-of-India (see here). 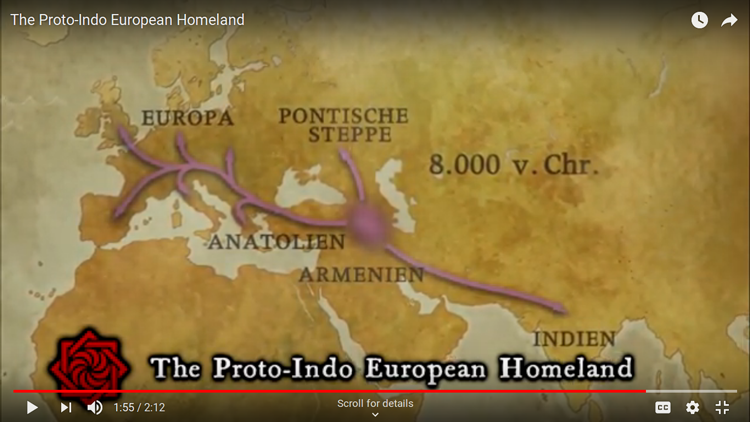 On a totally unrelated note, the Max-Planck-Institut für Menschheitsgeschichte (aka MPI-SHH) is apparently still claiming that its southern Proto-Indo-European (PIE) homeland theory has been corroborated by archaeogenetic data. For instance, check out the Youtube clip here. Below is a screen cap from the clip showing a map that summarizes what the folks at the MPI-SHH are thinking in regards to the PIE question and the early spread of Indo-European languages. D) Caucasus-related ancestry, of basically the same type that is being associated by the MPI-SHH with the PIE expansion, did move into Western Europe across the Mediterranean, but this happened during the Bronze Age and it impacted the island of Sardinia, which is generally regarded to have been inhabited by non-Indo-European speakers until the Romans got there (see here). Oops. 2) There's now overwhelming evidence both in ancient and modern DNA data that Eastern Europeans and Indians, especially Indo-European-speaking Indians, share significant ancestry, in particular paternal ancestry, from essentially the same Bronze Age populations living on the Pontic-Caspian steppe (not south of it! ), and this is the only obvious, important genetic link between these two linguistically closely related but geographically far flung groups within the last...tens of thousands of years? 3) Ancient samples from Mycenaean, and thus Indo-European-speaking, Greece and parts of Iron Age Iberia where Indo-European languages were attested at the time also show steppe-derived ancestry, and, in fact, of a very similar character to that shared by Eastern Europeans and Indo-European-speaking Indians (see here and here, respectively). 4) However, Pre-Mycenaean and likely non-Indo-European Minoan samples, also from the Aegean region, don't show any steppe ancestry, but they do show Caucasus-related ancestry, of basically the same type that is being associated by the MPI-SHH with the PIE expansion. Oops again. Thus, at the very least, these undeniable and, surely, easy to grasp facts that I've just set out should give pause to anyone who still claims that the Near East, rather than the Pontic-Caspian steppe, was the main staging point for the expansions of the early Indo-Europeans. Indeed, methinks it's now time to admit by all those concerned that the most likely homeland of all surviving branches of the Indo-European language family, and thus of late PIE, was the Pontic-Caspian steppe. Honestly, I'm shocked, and even disturbed, that none of this seems to have filtered down to the linguists at the MPI-SHH, especially since the MPI-SHH is also heavily populated by scientists who apparently know a thing or two about archaeogenetics. Now, it's true that archaeogenetic data are yet to reveal an unambiguous signal of steppe ancestry in samples from Hittite era Anatolia (five have been published to date), which may perhaps suggest that the people who brought Hittite and the other Anatolian languages to Anatolia didn't come from the steppe. Of course, Anatolian languages represent the earliest, most basal split in the Indo-European phylogeny, and thus aren't part of the late PIE node. So if the Indo-European-speaking ancestors of the Hittites didn't come from the steppe, then it stands to reason that early PIE didn't either. But this isn't relevant to my criticism of the MPI-SHH, because even if early PIE didn't come from the steppe, then like I said, there's very solid evidence now that late PIE did, and the problem is that the linguists and geneticists at the MPI-SHH appear to be missing this point, or they're unwilling to accept it. Moreover, please note that I'm not arguing that the linguists at the MPI-SHH are getting things wrong when it comes to actual linguistics. For all I know, their approach in this area might well be perfect, and perhaps it has indeed revealed insights that have been missed by others using more traditional methods? For instance, it's possible that the phylogeny of Indo-European languages as shown in the video linked to above reflects the truth better than anything else offered to date. I don't know, so I'm keeping an open mind about that. But admittedly, I'm skeptical, considering how lousy the MPI-SHH's interpretation of the archaeogenetic data has been to date in this context, even at the most basic level. Over at bioRxiv at this LINK. As far as I can see from skimming through the preprint, it's a thorough effort with conclusions that make good sense. 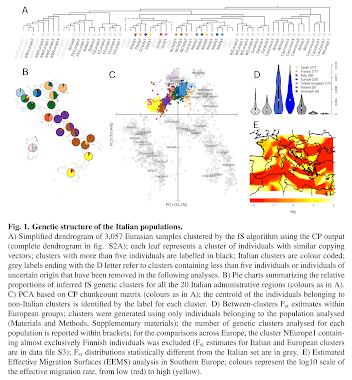 But, needless to say, it'll be very useful to plug the dataset from this study into the Global25 to see what these new Italian samples are really made of. Here's the abstract, emphasis is mine. How did Y-haplogroup N1c get to Bolshoy Oleni Ostrov? Y-haplogroup N1c probably entered Europe from Siberia during the Bronze Age or the Eneolithic period. It first appears in the European ancient DNA record in two samples from a burial site at Bolshoy Oleni Ostrov, in the Kola Peninsula, dated to 1523±87 calBCE (see here). These individuals also harbor significant genome-wide Siberian ancestry, but it's possible that this is in large part a coincidence, and that N1c spread into the Kola Peninsula from the south in a population of overwhelmingly European ancestry. Crazy, huh? Not really. Consider the qpAdm mixture models below for BOO002 and BOO004, the two males from the Bolshoy Oleni Ostrov site belonging to N1c, and BOO006, a female and the most Siberian-admixed individual from the same site. Although BOO002 and BOO004 show a lot of Nganasan-related and thus Siberian ancestry, they also require significant input from a source closely related to Baltic_BA, a fully European Bronze Age population from the East Baltic region. On the other hand, BOO006 doesn't need Baltic_BA for a successful model. Keep in mind that N1c is very common in the East Baltic today in populations with minimal Siberian genome-wide ancestry. Indeed, Latvians and Lithuanians can often be modeled with no Siberian input. Thus, it's likely that by the time N1c arrived in the East Baltic, probably during the late Bronze Age or early Iron Age, it did so with populations with heavily diluted Siberian genome-wide ancestry. Such groups may also have taken N1c north of the Baltic and into the Kola Peninsula. Historical linguists have long posited that Fennoscandia was a busy contact zone between early Germanic and Uralic languages. The first ancient DNA samples from what is now Finland have corroborated their inferences, by showing that during the Iron Age the western part of the country was inhabited by a genetically heterogeneous population closely related to both the Uralic-speaking Saami and Germanic-speaking southern Scandinavians. The samples were sequenced and analyzed by two different teams of researches, and their findings published recently in Lamnidis et al. and Sikora et al. (see here and here, respectively). This is how most of these ancients, whose remains were excavated from the Levanluhta burial site dated to 300–800 CE, behave in a Principal Component Analysis (PCA) based on my Global25 data. Levanluhta_IA are the Saami-related samples, while Levanluhta_IA_o is an Scandinavian-like outlier. Baltic_IA is an Iron Age individual from what is now Lithuania from the recent Damgaard et al. paper (see here). 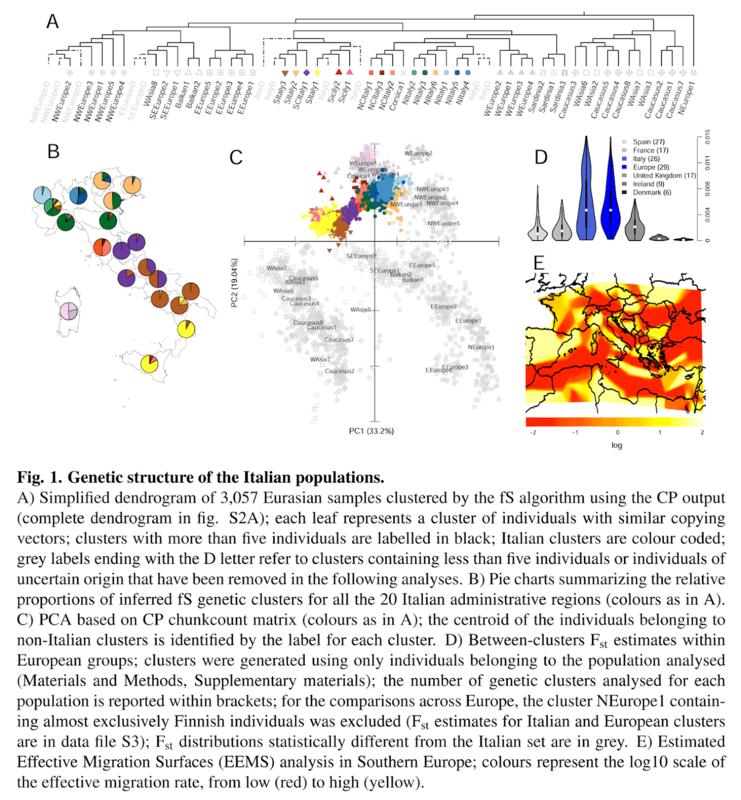 Note the accuracy of the Global25 data in pinpointing their genetic affinities and also the trajectory of the Levanluhta_IA cluster, which seems to be "pulling" towards Levanluhta_IA_o. The Saami and Levanluhta_IA are clear outliers from the main Northern European cluster. There are two reasons for this: excess East Asian/Siberian-related ancestry and Saami-specific genetic drift. 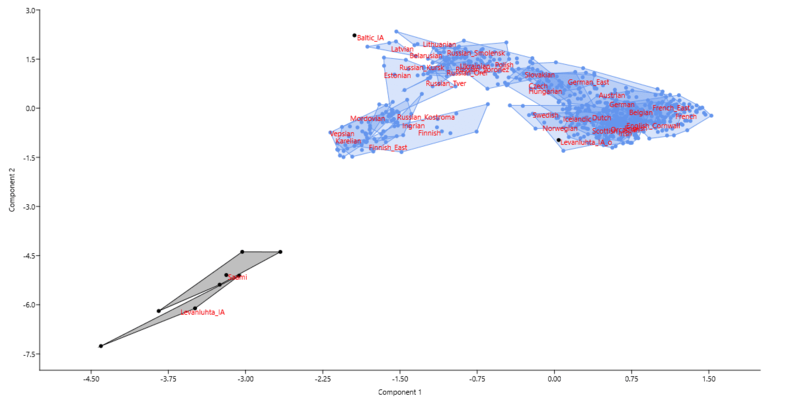 However, this eastern admixture and genetic drift are shared in varying degrees by other North European populations, especially those that also speak Uralic languages, and this is why they appear to be "pulling" towards the Saami/Levanluhta_IA clusters in my PCA. 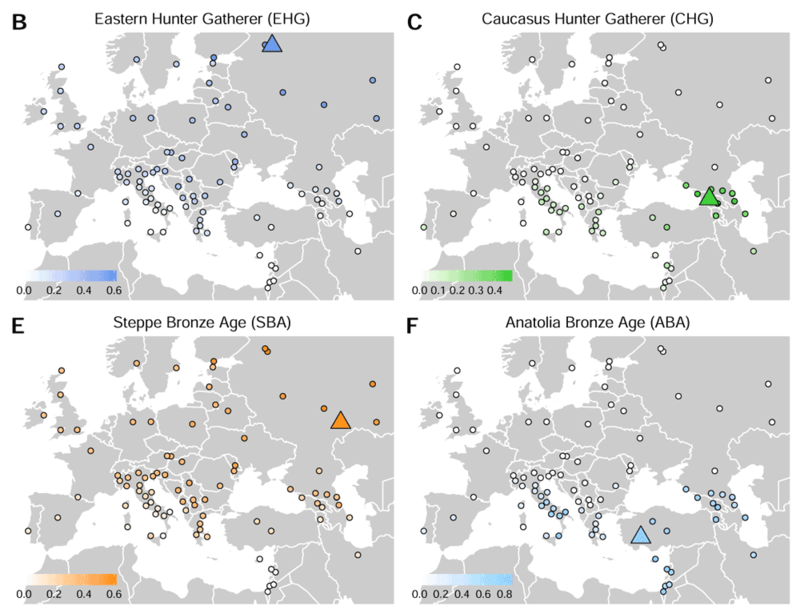 Thus, what this suggests is that the expansion of Uralic languages across Northeastern Europe was intimately linked with the spread of Siberian-related ancestry into the region. This idea has been around for a long time and is now becoming even more widely accepted (see here). However, Lamnidis et al. also featured samples from a likely pre-Uralic (1523±87 calBCE) burial site at Bolshoy Oleni Ostrov in the Kola Peninsula, present-day northern Russia, and, perhaps surprisingly, found that they showed even more Siberian-related ancestry than Levanluhta_IA. So what's going on? I'm confident that this discrepancy can be explained by multiple waves of migrations from the east into Northeastern Europe, possibly before, during and after the time of the people buried at Bolshoy Oleni Ostrov, by pre-Uralic, para-Uralic and/or Proto-Uralic-speaking populations. Consider the following qpAdm output, in which Levanluhta_IA is just barely modeled successfully as a two-way mixture between Levanluhta_IA_o and Bolshoy_Oleni_Ostrov. The statistical fit improves significantly with the addition of Glazkovo_EBA as a third mixture source. This is an ancient population from near Lake Baikal dated to 4597-3726 BC from the aforementioned Damgaard et al. paper. For the sake of being complete, I also tested whether Levanluhta_IA_o could be substituted by other similar ancient samples from the neighborhood, including those associated with the Battle-Axe and Corded Ware cultures. There's not much to report; qpAdm returned poor statistical fits and/or implausible ancestry proportions (for the full output from my runs, see here). Baltic_IA did produce a statistically sound model, but with excess Glazkovo_EBA-related ancestry. I also had to drop Bolshoy_Oleni_Ostrov from the analysis to make things work, which suggests to me that the result shouldn't be taken too literally. So as far as I can see, the western ancestry in Levanluhta_IA is likely to be mostly of Germanic origin, and thus Indo-European, meaning that it's logical to look east, perhaps far to the east, for the source of its Uralic ancestry. This might seem like a complicated and uncertain task, considering that Levanluhta_IA could well be at least a thousand years younger than the first entry of Uralic speakers into Fennoscandia. However, take a look what happens when I substitute Glazkovo_EBA with a variety of Uralic-speaking populations from around the Ural Mountains, which is where the Proto-Uralic homeland is generally considered to have been located. All of these models look great, and easily rival the best model with Glazkovo_EBA. Moreover, they make good sense in terms of linguistics. The only problem is that they're anachronistic, because the Uralic-speaking reference populations are younger than Levanluhta_IA. So I can't be certain that they reflect reality without corroboration from ancient DNA. It might turn out, for instance, that an Glazkovo_EBA-like population was already present somewhere deep in Europe before or during the time of Bolshoy_Oleni_Ostrov, while no such population existed around the Ural Mountains until the time of Levanluhta_IA. By the way, it might be important to note that the present-day Finnish samples in my dataset can't be modeled as a mixture between Levanluhta_IA and Levanluhta_IA_o. But they can be modeled as a mixture between Baltic_IA and Levanluhta_IA. I don't know which part of Finland they're from exactly; probably all over the place, so it'd be useful to test regional Finnish populations to see how they behave in such models. Of course, Finns aren't Saamic speakers, they're Finnic speakers, and they're probably the result of a more recent Uralic expansion into Fennoscandia than the one that gave rise to the Saami. Damgaard et al. didn't report the Y-haplogroup for Baltic_IA, but the word round the campfire is that this individual belonged to N1c, which is today the most common Y-haplogroup among Uralic speakers. Obviously, we need a lot more ancient DNA to sort all of this out, but things are already looking pretty much as expected. Stay tuned for new posts in this series following the publication of more ancient DNA relevant to this fascinating topic.